Gusseted shop ticket holder expands to hold instruction books, manuals, etc. 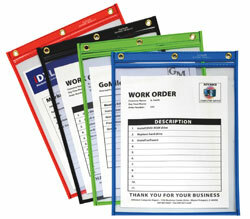 Durable, heavy-duty vinyl pocket keeps documents safe. Flap with hook and loop closure keeps documents secure. Strong, rigid, clear vinyl allows for easy visibility of documents. Reinforced stitched edge for longer product life. Convenient eyelet at top for hanging when open. Insert size 9 x 12 x 1. Holds up to 150 sheets. Learn about the wide variety of shop ticket holders at C-Line.. Suggested Use: Store large manuals, instruction books or catalogs in this durable pocket, which is able to expand up to 1 inch.